With masses upwards of 10 billion times that of the sun, ultramassive black holes are more common than originally thought. Using data from several observatories around the world, scientists have concluded that the expected masses of various black holes in our cosmic backyard were significantly understated, suggesting that some of those formerly classified only as supermassive might actually be ultramassive. "Ultramassive black holes - that is, black holes with masses exceeding 10 billion solar masses - are probably not rare; several and even dozens of these colossal black holes may exist," said Julie Hlavacek-Larrondo, the study's lead author. We currently expect supermassive black holes in the center of virtually every large galaxy. What we didn't expect, however, was the existence of so many ultramassive black holes. Looking initially at data from NASA's Chandra X-ray Observatory, researchers discovered that, in a sample of 18 galaxy clusters, at least 10 of the black holes are between 10 and 40 billion solar masses. "Some of our black hole mass predictions are just lower limits, so they could be higher," Hlavacek-Larrondo said, going on to suggest that we might one day find a black hole with 100 billion times the mass of the sun, "which really is ultra-big." Having located the black holes for the study, scientists estimated their masses by analyzing X-rays and radio waves generated by consuming their surrounding gas, dust, and stars. 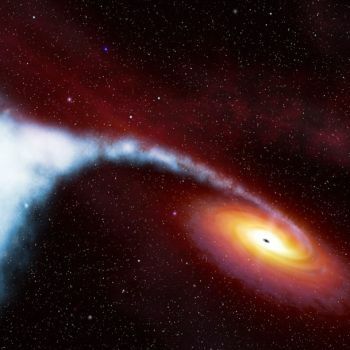 Using the X-ray data from Chandra, in addition to radio data from the Very Large Array in New Mexico and the Australia Telescope Compact Array, in addition to infrared data from the 2-Micron All-Sky Survey, researchers used the relationship between the amount of radiation they exude and the mass of the black hole to determine their sizes, though they discovered that these black holes are roughly 10 times the size one would expect given the size of their respective host galaxies. In short, scientists have no idea how these black holes came to be so large, given that their diet is largely restricted by the size of their host galaxy, current models don't do well predicting black holes of these masses. While there were some predictions of ultramassive black holes prior to the study, the fact that there are so many of them is still somewhat astonishing. Once the findings have been verified, they will have "important ramifications for understanding the formation and evolution of black holes across cosmic time."